Beyoncé has been getting some iffy advice of late. First there was the collab with Eminem, the washed-up perma-adolescent famous for making a career off the back of some serious mommy issues while offering the odd homophobic slur between album cycles. ‘Walk On Water’ was a big misstep in a career that has so far been light on mistakes (though as we noted here, certainly not free of them), and threw Beyoncé’s untouchable credentials into some doubt. Now, continuing her recent spate of pop collabs, she’s teamed up with Ed Sheeran for a ‘remix’ of his track ‘Perfect’. It’s a move that will likely befuddle some corners of the Beyhive who consider Beyoncé a boundary-pusher and an artist, not a trend-hopping rent-a-mouth looking to cash in on the Christmas market. Like many pop collaborations, ‘Perfect’ is a calculated move that’s mutually beneficial for both artists. Sheeran gets a boost to his fame by roping in the biggest pop star on the planet while also having a stab at snatching the Christmas number one. For her part, Beyoncé gets a guaranteed chart hit, something she might be hungry for given that her last albums have spawned singles more popular among critics than the music-buying public. In fact, it’s been 9 years her last US number 1 single. Still, you have to wonder whether a chance at coveting the number one spot is worth Beyoncé’s reputation. At this point in her illustrious career, a cheesy pop number feels somewhat beneath her, and her choice of collaborator feels forced and misguided. Sheeran and Beyoncé are at opposite ends of the pop spectrum and this stark polarity is laid bare on this rather flimsy duet. First of all, this is not a remix. 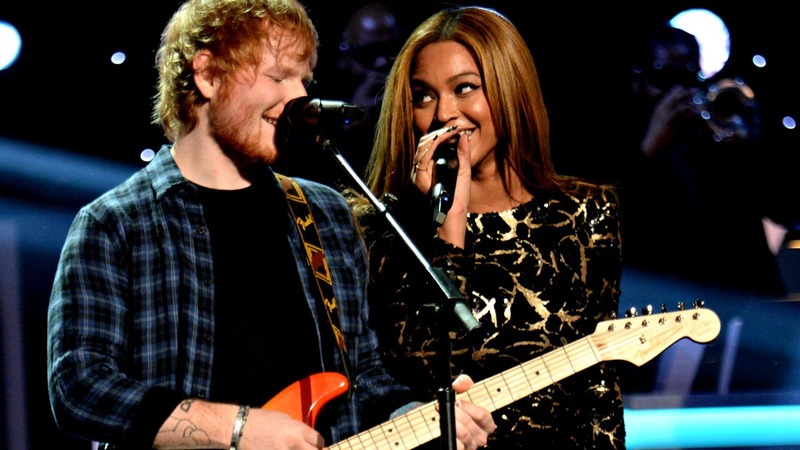 This is Beyoncé singing a bit of an Ed Sheeran song. And ‘Perfect’ is a song that is Sheeran through and through, written to suit the range and tone of his voice as well as his nice guy brand. When Beyoncé sings, she feels limited, her talent going untapped on a track that doesn’t have room for vocal flourishes or soulful adlibs. Though she sings the song beautifully, it sounds more like a karaoke effort than a proper Beyoncé track. ‘Perfect’ is aimed squarely at the Christmas number one spot, having been repackaged with a new cover featuring some hastily drawn on snowflakes. It’s a lazy attempt at a Christmas single, but listening to it in the throes of winter, there is a certain festiveness to be found in its sparse, romantic arrangement, evoking images of fireplaces and snowfall, Christmas lights and dinner table arguments about immigration. And if East 17 can get away with touting ‘Stay Another Day’ as a Christmas track, there’s no reason Sheeran can’t blag it too. All in all, ‘Perfect’ feels like a superfluous addition to both Sheeran’s and Beyoncé’s discographies, undermining Beyoncé’s reputation as an astute businessperson with a nose for a good deal and pushing Sheeran’s already tiring ubiquity to new levels with a cheap Christmas cash in. But though it might not be a credible move for either artist, there’s no doubt it will be a profitable one.